Why did I make these? Because I needed an excuse to buy some oilcloth. 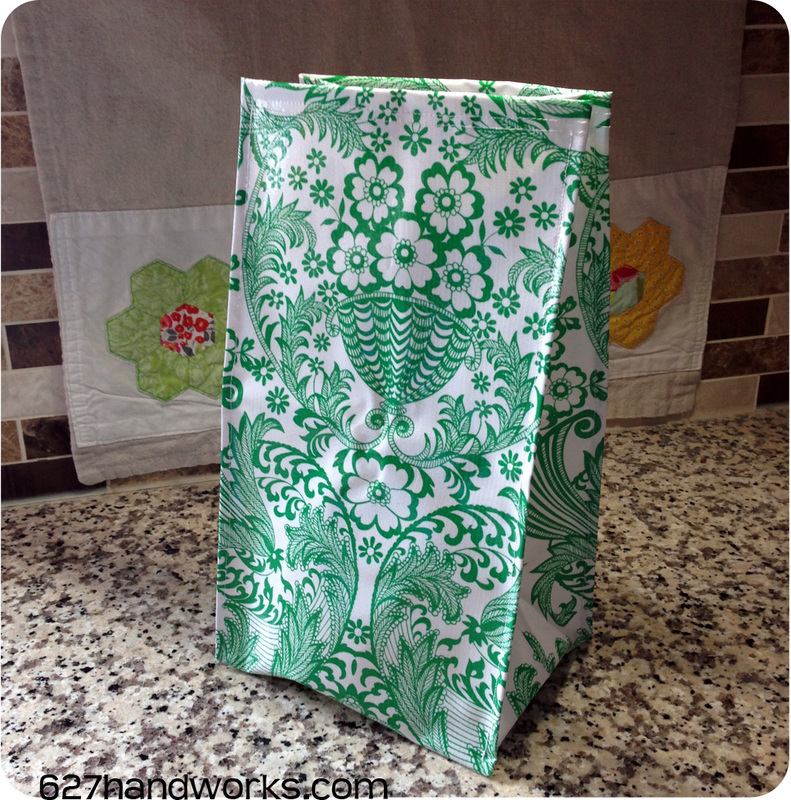 I really didn’t have a use for oilcloth but I was desperate to buy some. I made the blue and red bag using this pattern. 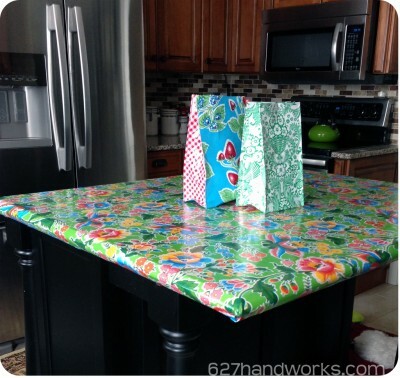 You can choose different prints for the side panels and just use pinking shears to finish off the top. 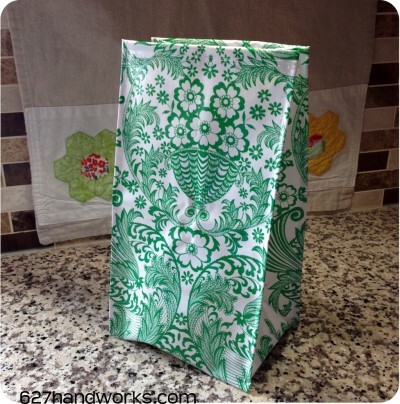 The green bag was made using this pattern. 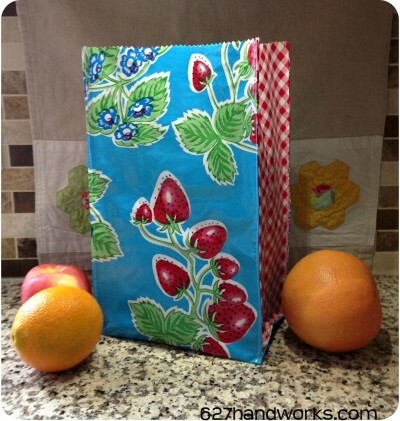 This one is closer to the true size of a paper lunch bag and has a finished top seam. And… here are my oilcloth bags on my oilcloth covered kitchen island. I know, a bit overkill. I put the cover on our island a few weeks ago because I am *desperate* for spring. I need to see some green! It’s March 24th and we just got 8 inches of snow. Go away already. The tabletop was easy to cover – just cut your oilcloth to size with a few inches of overhang, then tape underneath. I’ve read the painters tape will hold the fabric in place for months with no problem. The actual top is wood and this is so much easier to clean! Now I have an excuse to buy more designs so I can change this out. Maybe my friend Chelsea at Whatcha Makin’ Now would like one? I owe her this and more after she made me these freakin’ amazing Jell-O Sugar Cookies for my birthday. Any other ideas for oilcloth? HA! You know I would make you cookies any day of the week. I’d love one! 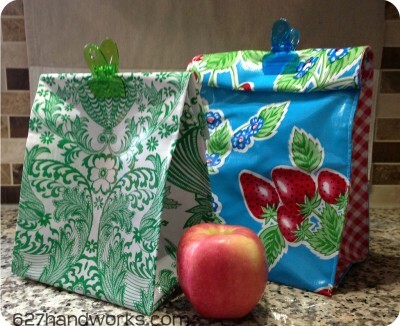 I’d probably use for lunch, but a gift bag is a great idea. You’re so sweet!! to understand this topic. You know a whole lot its almost tough to argue with you (not that I personally will need to…HaHa). Does anyone need custom made bags,backpacks or tote bags? We are the factory in the right position to offer you these products with quality and goods service.